This absurdist concept makes a big impression, while the goal of the type is communication, so it is designed for the reader. His face and costume tells a story and by illustrating it in high contrast with the background masked out the image is transformed into one with real power. The key to audience engagement with the Mr Fungus character is to make it simple, and make it big. 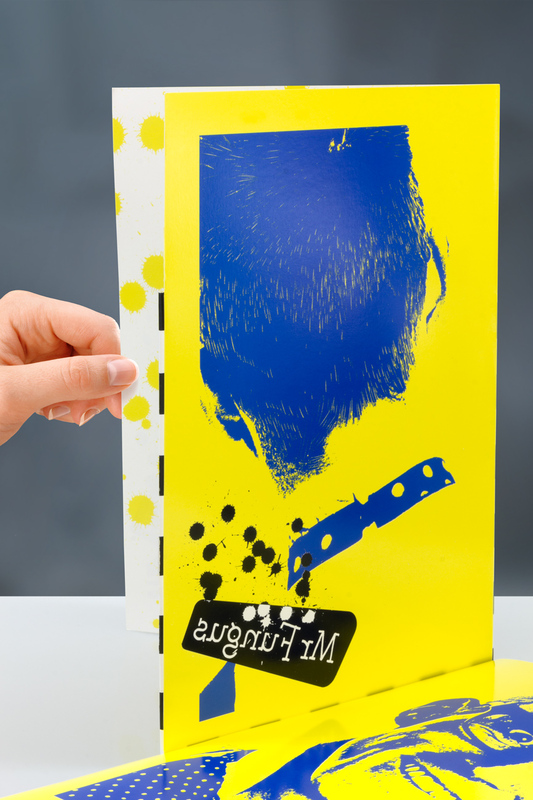 This Mr Fungus folder cover design does not merely fill space but creates a composition. Fergus Aitken, alias Mr Fungus, dresses up in funny clothes and clowns around for a living. A poster for New Zealand’s loudest mime. A poster for New Zealand’s loudest mime makes as much sense upside down. Let the fun of Mr Fungus’s portrait do the talking. There is no way of presenting a performing artist with more impact than with a good standalone photo. With someone comfortable in front of a camera the result is an extremely appealing way to make an impression. How could anyone resist? With its background cleared away the portrait is engaging, entertaining and, rendered in a high contrast lith image treatment, it has unusual clarity, it makes an impression as clear as a bell, and it leaves all the attention on Mr Fungus International Comic Mime (alias Fergus Aitken). After training in London at the Desmond Jones School of Mime and earning a living on the competitive streets of Covent Garden and at various international busking festivals, at age 25 Fergus returned to New Zealand to work full time as an entertainer. He needed a logo and self-promotional publicity kit to enable him to market himself and provide to talent agencies. 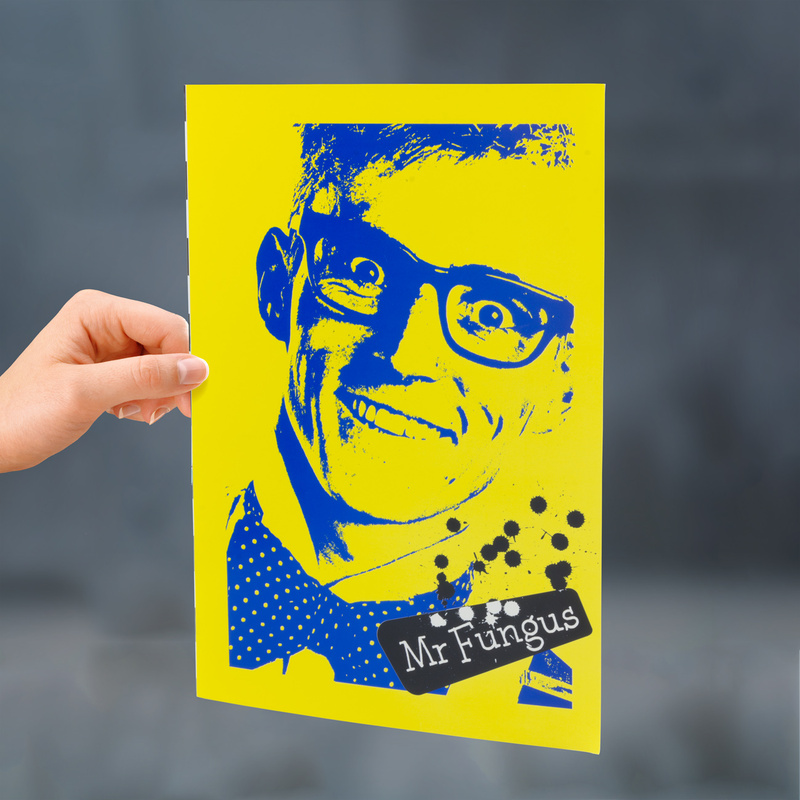 Rounding off the kit is a generic Mr Fungus poster that could be marked up in the space provided in black marker pen with specific event dates and times by event organisers. Energetic colours such as bright blue and brilliant yellow suggest vitality, humour and youth. The coordination made up of strong primary colours broadcasts loud and clear to everyone. Using these colours, in this big dramatic way makes a splash, wherever these folders end up going. The detail of the black & white striped spine, Mr Fungus logo, and the vivid white and yellow inside the folder make a powerful and vivid contrast to the big dramatic front and back cover. The result of this combination is handsome, funny, and almost literally arresting to the point of seizing attention. More raw power and brilliance for the buck comes from the dynamic combination of yellow and blue than any other two colours. The logo is traditional, consisting of the Mr Fungus name and a single carefully crafted graphic of scattered ink spots, which is uniformly applied to every document. But the design has a refreshing twist, the three logo elements can be adapted and applied in a cheerful style suitable for any use. And it imbues in the stationery items, when they are combined, fun and artistry. Every piece is different; the arrangement from business card to folder to even a poster changes to best adapt to the space and what the piece needs to do. The Mr Fungus logo makes for lots of expressive possibilities!